On May 19, 1972 — the 82nd birthday of Ho Chi Minh, communist leader of North Vietnam – shortly before midnight, a woman known only as Anna entered the women’s bathroom on the fourth floor of the Air Force wing in the Pentagon, the massive US military headquarters just outside Washington, DC. 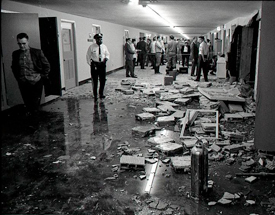 Shortly after, at 12:59 am, an explosion ripped through the restroom, tearing walls and floors, bursting pipes, sending water cascading down to a computer room below, destroying data-laden tapes. Six minutes later, a call came into the newsroom at the New York Times. The voice on the phone said that the Weathermen, a radical organization violently opposed to America’s “war” against the counterculture – and US involvement in Vietnam — claimed responsibility for the blast. It was the first bombing in the Pentagon since its completion in 1942. The action, the voice said, was “in retaliation for the US bombing raid in Hanoi,” the major city in North Vietnam. Since 1969, the Weathermen had terrorized America with a string of bombings stretching from coast to coast, beginning with the 1969 bombing in Chicago of a statue dedicated to police casualties in the 1886 Haymarket affair, a deadly confrontation between labor supporters and the Chicago police. The blast broke almost 100 windows and blew pieces of the statue onto the nearby Kennedy Expressway. Later, shots were fired at the Cambridge, Massachusetts, police station – again, an act claimed by the Weathermen. Then, in Chicago, several police cruisers parked in a precinct parking lot were bombed, in retaliation, the underground group said, of the fatal police shooting of Illinois Black Panther Party leaders Fred Hampton and Mark Clark. Next year, in 1970, the bombings turned deadly; an explosion at the San Francisco Police Department Park Station killed one officer and injured several others, including one seriously. Ayers, the self-confessed mastermind behind the Pentagon bombing, would go on to become a professor in the College of Education at the University of Illinois at Chicago, holding the titles of Distinguished Professor of Education and Senior University Scholar.